Hughes Aerospace Division (now part of Boeing Satellite Development Center) built the Syncom satellites for NASA in the early 1960s, at the dawn of the space communications era. Syncom is short for Synchronous communications, so named because it was the first operational satellite placed in a geosynchronous (aka geostationary) orbit. 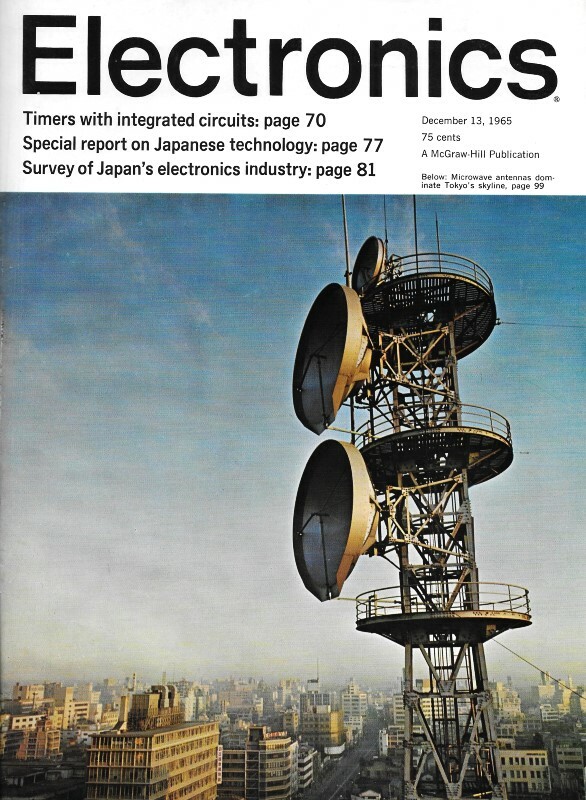 It was a big deal because its stationary positioning meant that not only was it constantly in view of earth-based communications stations, but earth-based antennas did not need to have expensive, sophisticated tracking systems to access the satellite. Once the Gold Rush had panned out (pun intended) in California, the booming aerospace industry was one of the largest attractions for the state. 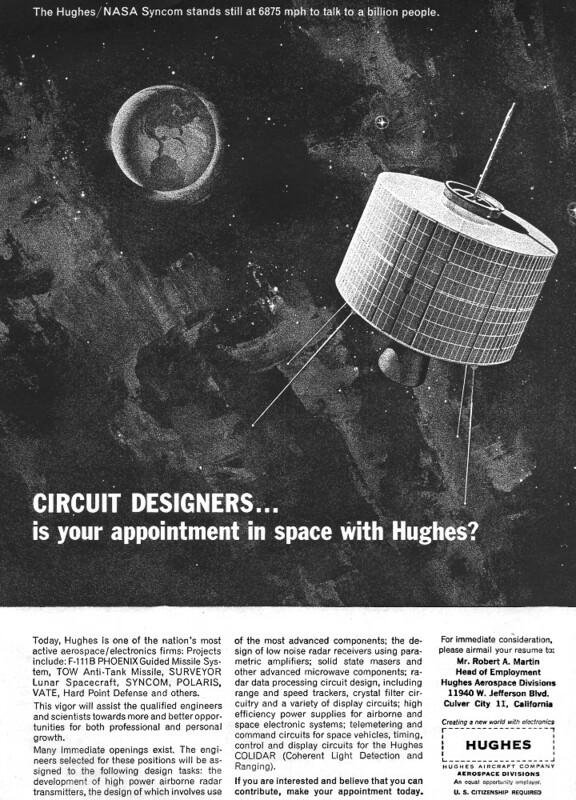 Hughes' advertisement in this 1965 issue of Electronics magazine targets circuit designers who were thinking of "high" in terms of getting a satellite high (22,336 miles) into outer space in geosynchronous orbit at a speed of 6,875 mph. Concurrently, California flower children (aka hippies) of the day were thinking of "high" in term of getting themselves high and spaced out by using speed. The Hughes/NASA Syncom stands still at 6875 mph to talk to a billion people. is your appointment in space with Hughes? Today, Hughes is one of the nation's most active aerospace/electronics firms: Projects include: F-111 B Phoenix Guided Missile System, TOW Anti-Tank Missile, Surveyor Lunar Spacecraft, SYNCOM, Polaris, VATE, Hard Point Defense and others. This vigor will assist the qualified engineers and scientists towards more and better opportunities for both professional and personal growth. Many immediate openings exist. The engineers selected for these positions will be assigned to the following design tasks: the development of high power airborne radar transmitters, the design of which involves use of the most advanced components; the design of low noise radar receivers using parametric amplifiers; solid state masers and other advanced microwave components; radar data processing circuit design, including range and speed trackers, crystal filter circuitry and a variety of display circuits; high efficiency power supplies for airborne and space electronic systems; telemetering and command circuits for space vehicles, timing, control and display circuits for the Hughes COLIDAR (Coherent Light Detection and Ranging). If you are interested and believe that you can contribute, make your appointment today.